Build your very own collection of your favourite diecast cars and trucks made with the finest materials! 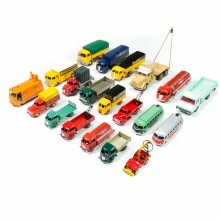 Build your own collection of your favourite diecast cars and trucks made with the finest materials. Already assembled, you only need to showcase your models, from Jaguar cars to tractors and dinky toys. Choose yours today and build your collection! Just like the iconic vehicles that they replicate, we try to make sure that all of our diecast model cars and trucks are made to the highest standard. To ensure great, consistent quality throughout our entire range, we only use strong, durable and tested methods to create our models. By utilising diecast models whenever possible, we can assure a professional, high-quality finish. At Model Space, we take full measures to ensure our diecast models are faithful replicas. This is your chance to add the car of your dreams to your collection. Expand your collection with the Jaguar Grand Tourer series, the XK Power Series or add the iconic Le Mans Jaguar series, all in 1:43 scale. Each Jaguar model comes plinth-mounted, ready for display. We also have a wide range of Dinky Trucks, faithfully replicated from the Dinky Toys models that have the same scale, colors and finish of the original models. From the Simca Cargo to the Ford Flatbed, each truck comes in its own box that features the original design. 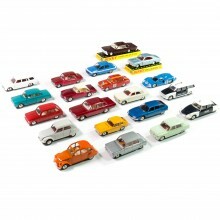 If you like Dinky Toys, don’t forget to check out our exclusive collection of Dinky Toys cars. Each diecast car is expertly presented just like the originals. Add some of the most classic cars to your collection, such as the Simca 1500 Break and the Alfa Romeo Giulia Rallye. Each car has a finely detailed interior, working suspension and opening parts. 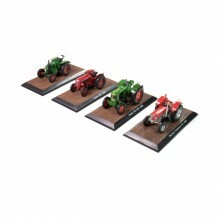 For those interested in agricultural vehicles, we have a great collection of diecast tractors. With a 1:32 scale, these faithful replicas have been painstakingly reproduced to ensure they faithfully depict these legendary tractors. This selection is exceptionally suited for collectors. To view our full range of diecast vehicles and collectables, please click here.